A giant Bruno "Ugly" Mannheim from Superman #654 (September 2006). Intergang first appeared in Superman's Pal Jimmy Olsen #133 (October 1970) and was created by Jack Kirby. Intergang was run by a gangster named Bruno "Ugly" Mannheim, as revealed in Jimmy Olsen #139. He was, however, getting orders and weaponry from Darkseid, who was using Intergang to help track down the Anti-Life Equation. Intergang also worked with Morgan Edge, the head of the Galaxy Broadcasting System television network (which had recently purchased the Daily Planet and had Clark Kent transferred to its Metropolis affiliate WGBS-TV as its anchorman). It was later revealed that this was not the real Morgan Edge, but a clone from the "Evil Factory." When the clone could not bring itself to kill the original Edge at the order of Darkseid the real Edge was imprisoned. The original Edge would later escape with the help of Jimmy Olsen. During an ensuing battle with Intergang the clone was mistaken for the original by Intergang hitman Tombstone Gear and incinerated. The real Edge was soon free to resume his role as Galaxy's president. In the Post-Crisis DC Universe, Edge was the leader of Intergang, until he suffered a heart attack due to stress. While he believed he was working for Darkseid, his Apokoliptian contact was actually DeSaad, whose only aim in supplying him with weaponry was to cause suffering. While he was in the hospital his legitimate businesses were taken over by his father Vincent Edge, and Intergang was taken over by Ugly Mannheim, who trained on Apokolips with Granny Goodness. A later retcon has it that Mannheim was the original leader of Intergang, dealing knowingly with DeSaad. How Edge took over is unrevealed. Eventually, Intergang was brought down by Clark Kent and Cat Grant, Mannheim was arrested, but managed to escape. He attempted to disappear through a "boom tube" (a New Gods transporter), but it collapsed when he was halfway through. Some time later, Mannheim's father "Boss" Moxie Mannheim, a gangster who had been in prison since the 1940s after being captured by the Newsboy Legion, was released. Discovering that the Newsboys were, seemingly, the same age as when he first fought them, he determined to find out how such a thing could be. Meeting renegade Project Cadmus geneticist Dabney Donovan, he arranged for himself and his former gang members from the 1940s to be cloned into youthful bodies with superpowers. Using Vincent Edge to arrange a meeting between Metropolis' gang-leaders, he killed them all, and declared himself the new head of Intergang. The new Intergang spent much of their time tracking down Jimmy Olsen, whom Moxie believed knew Superman's secret identity. Following a short-lived attempt by Morgan Edge to regain control, Lex Luthor gained control of Intergang, retaining Moxie as a figurehead. Moxie and his lieutenants were later captured by Superman. When last seen, Intergang was run by a criminal cyberneticist named Frank Sixty. There was some suggestion that Boss Moxie (who was a member of the Secret Society of Super Villains at the time) was slain during the miniseries Infinite Crisis. The suggestion comes from a sequence during the Battle of Metropolis, during which Superboy-Prime snaps a villain's neck, killing him. In an interview DC editor-in-chief Dan DiDio confirms that Boss Moxie did indeed die in Infinite Crisis #7 by stating that Superboy-Prime snapped his neck. In week 9 of the ongoing 2006 weekly series, 52, the Question tells Renee Montoya that Intergang is preparing for an invasion of Gotham City. Two weeks later, the pair finally have a confrontation with the two operatives of Intergang in Gotham, Whisper A'Daire and Kyle Abbot, known in the public eye as the manager of HSC International Banking, an holding connected to Intergang itself, and her bodyguard. In the weeks that follow, the further investigations of Montoya and the Question reveal Intergang to be operating a mining company called Ridge Ferrick in regions such as Australia, and also having expanded into nations such as Oolong Island, Bialya and Yemen, reorganized along quasi-religious lines, complete with a "holy" text known variously as the Book of Crime or the Crime Bible, which treats Cain as a heroic, if not semi-divine, figure for his role according to Judeo-Christian theology in creating the "most sacred" crime of murder. It has even been revealed that the original text is bound by the stone with which Cain slew Abel. In issue #25, Bruno Mannheim was revealed as the current head of Intergang, which is also behind the kidnapping of many of the world's "mad scientists", in a grand plan to take over America by the end of the year. He shows himself now acting like a cult leader, exalting the power of crime as the dominant order in the 21st century, and now becoming a cannibal, eating anyone he kills who refuses to join Intergang. At the same time, Magpie and Ventriloquist swear their allegiance to Intergang. In Superman #654, Bruno "Ugly" Mannheim returns as a giant wielding alien technology, claiming that someone other than Darkseid is behind Intergang's current activities. In the storyline Gotham Underground, Intergang is in a gang war with Tobias Whale. Intergang buys him out and makes Tobias Whale the CEO of Kord Enterprises which has become a front for Intergang's criminal activities. Moxie Mannheim - First leader of Intergang and the father of Bruno Mannheim. Morgan Edge - Second leader of Intergang and the son of Vincent Edge. Vincent Edge - Third leader of Intergang and the father of Morgan Edge. Bruno Mannheim - Fourth and current leader of Intergang and the son of Moxie Mannheim. He was later retconned as the original leader of Intergang. Lex Luthor - Fifth leader of Intergang. Frank Sixty - Sixth leader of Intergang. Darkseid - The benefactor of Intergang. Alistair Bendel-White - A fixer. Aku Kwesi - A criminal who was responsible for murdering Vixen's mother. Dabney Donovan - A mad scientist that worked for Project Cadmus. Johnny "Stitches" Denetto - A crime boss who had his face peeled off by Tobias Whale back when he used to work for him. Desaad sewed a new face onto him which was made from dead humans and animals. Mari Nichol - The daughter of the second Doctor Polaris. Pestilence - Member of the Four Horsemen of Apokolips. Tobias Whale - He ended up bought out by Intergang and made the CEO of Kord Industries to serve as a front for Intergang's activities. Torque - Dudley Soames is a detective from the Blüdhaven Police Department who was secretly on Blockbuster II's side. His head was twisted 180 degrees by Blockbuster II for crossing him yet survived. Due to his head remaining at this angle, Torque uses mirrored glasses to see forward which allowed him to see all 360 degrees of the battlefield. War - Member of the Four Horsemen of Apokolips. Intergang is seen in Metropolis robbing a bank during the Justice League's absence, only to be stopped and beaten by the Avengers. In the first probable future of Superman, seen by Waverider, Intergang takes Metropolis hostage with a nuclear bomb, which detonates due to a member of Intergang being too nervous, leading to Lois Lane's death (among others), and thus, Superman destroying every nuclear weapon that exists on Earth. Intergang appeared in several episodes of Lois & Clark: The New Adventures of Superman. Some names were changed, Vincent and Morgan Edge became Bill Church, Sr. (played by Peter Boyle), and Bill Church, Jr. (played by Bruce Campbell), Galaxy Broadcasting became Multiworld Communications, etc. No mention was made of Apokolips. By the end of the series, both Churches were in prison and Intergang was being run by Bill Church, Sr.'s young wife, Mindy (played by Jessica Collins), who appeared to be an airhead, but was actually a ruthless mastermind. Mindy and Bill worked together to frame Bill Church, Sr. after going straight, but Mindy double crossed Bill Church Jr. and both Bill Churches went to jail. In a Christmas episode, Mindy worked with another person to poison Superman with a Krypton disease. Superman was later cured. Mindy got her accomplice arrested, by making the authorities think that her office was his office. In Superman: The Animated Series, Intergang was run by Bruno Mannheim (voiced by Bruce Weitz, who also played the Church Sr.'s lawyer on Lois & Clark). Mannheim was often the target of the Toyman, a villain who used incredible—and lethal—toys to get revenge on him for framing the Toyman's father for embezzlement. Darkseid supplied Mannheim with Apokoliptian technology to further his own agenda, using his personal assassin Kanto as an intermediary. Mannheim was later presumably killed in the explosion of a nuclear power plant when helping Darkseid. In a later episode, Intergang was reorganized under the leadership of Granny Goodness. In Justice League, Morgan Edge was portrayed as living on an island with his own personal army and then is frozen by Killer Frost as the Secret Society (Gorilla Grodd, Parasite, Sinestro, Giganta, The Shade and Frost) freed Clayface (who was being held in different containers by Edge). Intergang received a brief mention in the Justice League Unlimited episode "This Little Piggy". During a stakeout, an impatient Wonder Woman asked Batman what the criminal organization would want with the Rosetta Stone. Batman replied with the remark "Intergang moves in mysterious ways." Intergang appears in Young Justice. Known members include Bruno Mannheim and Whisper A'Daire. In "Disordered," Bruno Mannheim and Whisper lead some Intergang operatives into robbing gold from an underground bank vault until Superboy and the Forever People arrive. The Forever People are surprised that Intergang is using technology that is from Apokolips. Upon bringing their battle to the surface, the Forever People summon Infinity-Man who repels Intergang. Intergang escapes through a Boom Tube leaving Whisper behind. Upon probing Whisper's mind, Beautiful Dream reveals that Intergang's weapon supplier is Desaad. When Superboy and the Forever People find an abandoned warehouse consisting of technology from Apokolips, they are ambushed by Desaad and Intergang. Desaad throws the Father Box into the formation of Infinity-Man in order to control them. 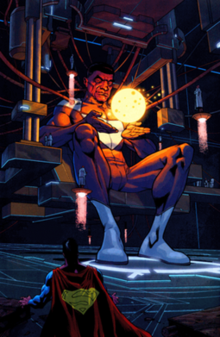 With help from the New Genisphere, Superboy reclaims control of Infinity-Man and defeats Intergang. In "Performance," it is referenced that Intergang hired Parasite to steal components for a black hole generator. In "Salvage," Superboy and Blue Beetle spot Bruno Mannheim and Whisper heading towards the Hall of Justice. Bruno and Whisper end up using a special Apokolips technology to combine the Appellaxian bodies into an Appellaxian Golem that attacks Superboy, Blue Beetle, Wolf and Sphere. Bruno and Whisper then get away on the Appellaxian Golem. Bruno and Whisper land in the woods where Bruno plans to make the Appellaxian Golem its enforcer in order to expand Intergang. Superboy, Wolf and Blue Beetle catch up and Sphere jams all Apokoliptian signals in the area, causing Bruno to lose control of the Appellaxian Golem which heads to the Arlington Nuclear Power Plant. Superboy restrains Bruno and Whisper as Blue Beetle restrains them with special locks. After the Appellaxian Golem is destroyed by the Partner of The Light, Bruno and Whisper are found in a catatonic state, having been silenced by Sportsmaster as a warning to anyone who challenges The Light. Intergang is mentioned in an episode of Supergirl called "The Adventures of Supergirl". It is described as an organisation who connects various terrorists and mercenaries around the world. One known member who had association with them is John Corben aka Metallo. Intergang is also mentioned in the Arrow episode "Docket No. 11-1941-73." When Oliver Queen and Felicity find out that the prosecution in Oliver's upcoming trial is headed by Alexa Van Owen, Felicity does a background check on her and mentions that she has taken down Intergang and Bruno Mannheim in court. Intergang appears in DC Universe Online. In the hero campaign, the players help Question and Batwoman investigate Intergang's activity in Gotham City's Diamond District where they send the players to an Intergang penthouse in Gotham City to interrogate the underboss. Upon investigating the Intergang, the players learn that the Crime Bible's prophecy states that it promises infinite power once Bruno Mannheim kills the twice-named daughter of Cain. When the players go through the sewers to get to a mysterious warehouse, they witness Batwoman getting captured with her being the twice-named daughter of Cain. After the players defeat Kyle Abbot and Whisper A'Daire, Oracle sends the players some possible locations where Bruno Mannheim and his Crime Bible might be which eventually led them to the Temple of Crime. In the villain campaign, Deathstroke and Calculator send the players to an Intergang penthouse in Gotham City to interrogate the underboss on the location of the Crime Bible. Upon interrogating the Intergang underboss, the players learn that the Crime Bible's prophecy states that it promises infinite power once Bruno Mannheim kills the daughter of Cain. When the players go through the sewers to get to a mysterious warehouse, they witness Batwoman getting captured with her being the twice-named daughter of Cain. After the players defeat Kyle Abbot and Whisper A'Daire, Calculator sends the players some possible locations where Bruno Mannheim and his Crime Bible might be which eventually led them to the Temple of Crime. Intergang's soldiers consists of Crime Cultists, Intergangsters, Maulers, Shooters, Slashers, and Stabbers. Mannheim appears as a boss in the Game Boy Advance game Superman: Countdown to Apokolips. Here too, he is supplied weapons by Darkseid, through Kalibak.